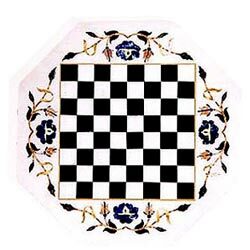 Get set to get compliments from one and all for this marble table top with chess design! It has been beautified by the designs brought forth by semi-precious stones. 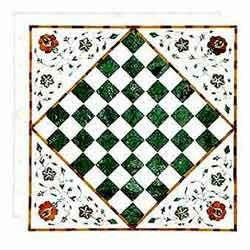 Let your game get a face-lift with the spellbindingly beautiful floral border around chessboard that has intricate inlaid designs on White Marble using semi precious stones. 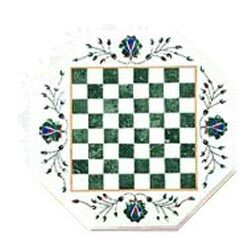 Grab the opportunity of once in a lifetime game of chess on this chessboard inlaid using semi-precious stones on a White Marble with a very intricate and colorful floral border. 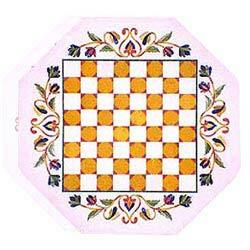 Here's a table top that shall compel you to go gaga over its beautiful designs. 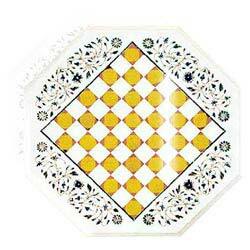 Inlaid with stones, it shall give your home, a chic yet elegant look. We extend our creativity to present to you an extraordinarily colored chessboard inlaid on White Marble to facilitate a colorful game on this octagonal table top. 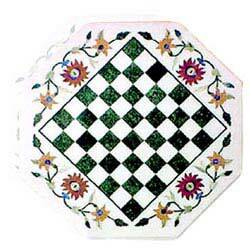 Inlaid stones create a magical effect on this table top. 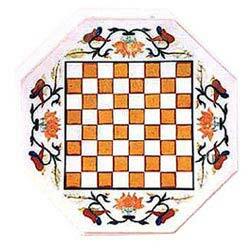 Chess design, complimented by creeper on the corners, it is the epitome of an artist's creativity. 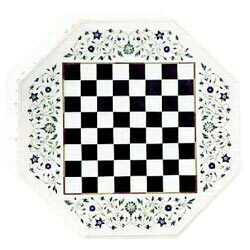 Words fail to describe the subtle beauty of the artistic fusion of an octagonal table top and a chess board inlaid on White marble bordered with floral design.